I pointed to two old drunks sitting across the bar from us and told my friend, "That’s us in 10 years." She said, "That’s a mirror, you fool!" Smith goes to see his supervisor in the front office. "Boss," he says, "we’re doing some heavy house-cleaning at home tomorrow, and my wife needs me to help with the attic and the garage, moving and hauling stuff." "We’re short-handed, Smith," the boss replies. "I can’t give you the day off." Thought I would share this story from a class at a Secondary College. As part of my day job at Destination Rotorua Tourism Marketing as Web Development Coordinator I setup and maintain the official Rotorua Facebook fanpage. Along with Craig Hammond, rx the Domestic and Events Marketing Coordinator, discount we keep the posts and updates coming that automatically get posted to our official Rotorua Twitter account. On March 22, impotent I posted “Counting the fans until we hit 3000, only 76 to go! 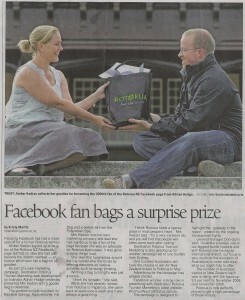 Might have to round up a goodie bag for the 3000th fan!“, five days later Rotorua had their 3000th fan. So the following week I contacted some local Rotorua operators who are actively using Social Media in their marketing plans and a few quickly came baring gifts that I could present to our 3000th fan, Amber Kedian. 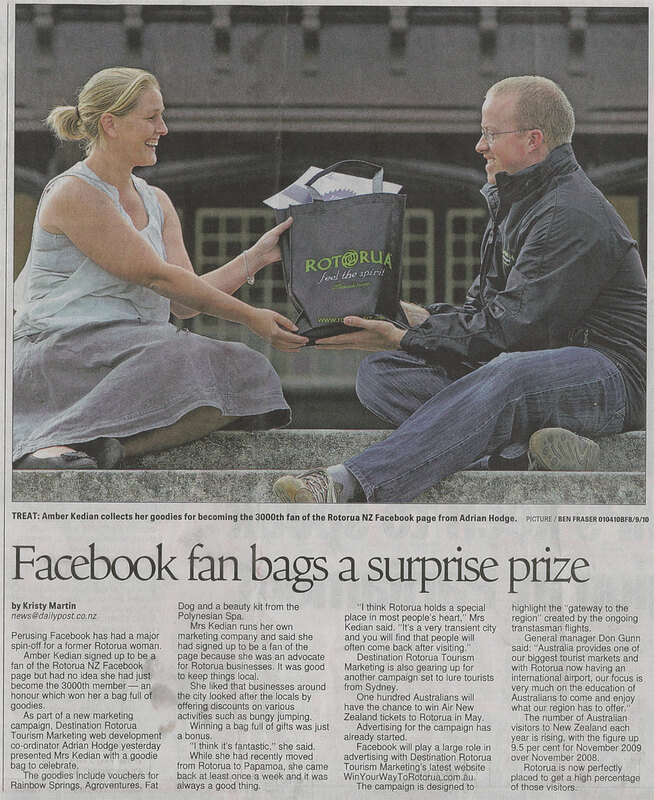 Read the article online at the Rotorua Daily Post.